I enjoyed sharing the last post I did, talking about serving student leaders at OCBP and curating the book display at the Civitas gathering, sponsored in DC by our friends at CPJ. I was just trying to be clever when I mentioned the alphabet soup. But at 7:00 Wednesday night here in Dallastown we really are diving into Godly alphabet soup. 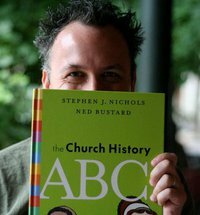 As we’ve said before, our friend Ned Bustard (Square Halo Books) designed and illustrated a fantastic new children’s book on church history, called The Church History ABCs: Augustine and 25 Other Heroes of the Faith (Crossway; $15.99.) Most of the text was written by uber-smart PhD guy Steve Nichols from nearby Lancaster Bible College, and the spiffy artwork was done by the aforementioned Mr. Bustard, almost shown, to your right. 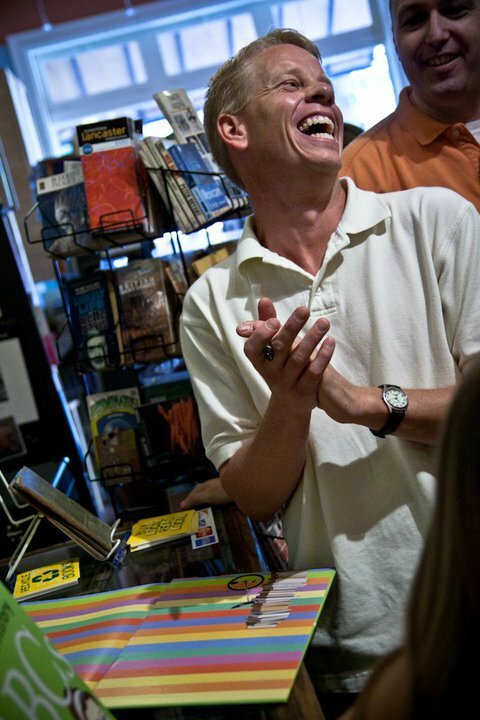 We will be hosting a book release party, reception, and reading here at the shop. There will be some alphabet-themed refreshments, too. How does one do a reading from an alphabet book, you ask? Hey, have you never read Dr. Seuss right out loud? Of course you have! This is going to be great! It will be fun to read this out loud–maybe even get some crazy unison thing going on. (Will the Lutherans out-shout the Calvinists on their respective pages? Will we all groan at the Knox-Knox joke?) We’ll hear about Ned’s artistic vision, maybe his collaboration process with author and editors, learn just how a classy kid’s book comes to be. 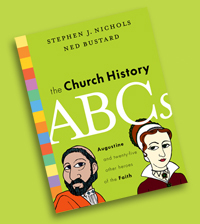 With the interesting blend of bright color, stylized illustration, computer graphics and real photography, The Church History ABCs really is tremendous-looking. I think it is one of the more artfully designed kid’s picture books on any Christian publishing house, and certainly stands up with the greats so far this year in the design category. I suppose I’d want to say this even if it weren’t true since Ned is such a nice fellow, and really deserves acclaim (even from our small corner of the universe) but—yes—it really is true. This is a very, very wonderfully designed book. And the content? Whewie, let’s hear it for nerdiness of the first order. A kid’s book about church history? Most adults don’t even read church history. Well. Maybe, just maybe, that may be part of these dude’s sneaky plan. Come to think of it, I’ll bet this will make Screwtape himself squirm like the devil: helping young covenant kids learn about martyrs and heroes, men and women who served God in significant ways, saints who did important things to keep God’s work going? Children learning about the past faithfulness of God to His people? Having fun learning about early church conversions, medieval scholars, Reformation leaders, missionaries, artists and thinkers, queens, servants and prophets? My, my, this is important stuff. It is a very important contribution to Christian education, and I don’t know anybody else who had attempted such a thing with such simple focus and great gusto. So. Having raved about the creative design and the important, informative content, allow me to note how well form and function unite in this happy book. That is, there is cool artwork for each character, nifty stuff that teaches well, even in small ways that will reveal themselves upon repeated reads. Playfully studying the text together a second or third time, looking carefully, you’ll learn even more about cool details—why does Jonathan Edwards have a bar of chocolate in his hand, and why the Indian feather? And what is that in Spurgeon’s vest coat pocket? What’s with the picture of Venice in the Vivaldi page? And the baby Jesus by Ignatius? Who–with a B name—was “America’s first bard”? Granted, the word Pirates starts with P so it fits on the P-page with Patrick, but is there another reason for that skull & crossbones? And why the Philadelphia Liberty Bell on the J page with Absalom Jones? The last few pages are for older readers (or mom and dad or Sunday School teachers) as it gives more detail about each of the characters shown. Very helpful, and so important. And, after they do the alphabetical order descriptions of the characters, they offer another listing, this time in chronological order, as in an historical timeline. Did I mention that Ned helps design homeschooling curriculum? This small touch is very, very helpful, and further shows the thoughtfulness they put into this. hasn’t ended yet. Someday you will be adding your own story to it.” At the very, very end, they note again in passing that God’s unfolding of church history isn’t quite over yet. “The story of church history is your story” they say. So right. Insofar as we are in Christ, a part of His Kingdom, then this is, indeed, our story. Or, should I say, it is God’s story, being written in the characters of our lives. One big beef of my own. Saint Francis of Assisi. Yeah, yeah, I know they felt they had to put somebody else on the coveted F page, but really? Skipping Saint Frank? Or, maybe he will be in the next volume, perhaps already in the scheming? If only they can think of another saint with an X and a Z name. 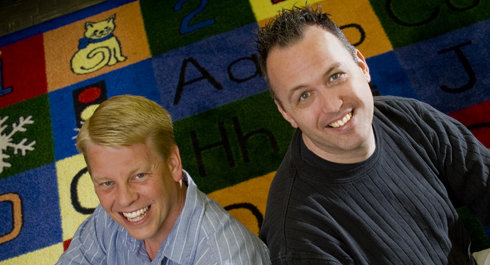 Here is a picture of Stephen Nichols and Ned Bustard. I only wish they’d have been in Ned’s drawn caricature, to show that they, too, are great characters in God’s unfolding history. WANT AN AUTOGRAPHED COPY? PLACE AN ORDER ASAP. If you want it inscribed to anyone particular, be sure to tell us to whom you want it signed. This will take you to our secure order form page.